So these Delta Force movies are being filmed on some sort of well purposed sound stage or that’s what it looks like. A lot of these action sequences look like I’m wacthing some sort of Universal studios theme park ride. 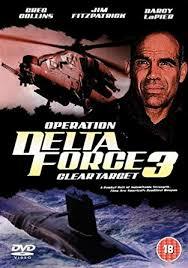 Operation Delta Force 3 is already a better sequel than Operation Delta Force 2 because it’s an actual sequel using the same guys from the last movie, well not all of them, but it does include Gavon Hood who will go on to fame as the director of X-Men Origins: Wolverine and Ender’s Game the only thing I’m really missing from the original Operation Delta force it had a splash of color with Ernie Hudson. I do like the fact that these movies seem to be nothing more than stunt men going wild in their own environment. There is a story but not much too it. If there is a screenplay I would not be surprise if it took 20 pages to make a 90min film, that’s mostly stunts. Ninety minutes of stunt work. When it comes to this film franchise that’s not as appealing as it seems.